That download links to 3.31, no 3.32. You ought to fix that. Ops . Thanks for the tip . I thought I had updated the link... but you were right. I didn't. Anyway, the link is sorted now . 2.1 translates 16-bit or 24-bit images in 256-palette more qualitatively. No, man... That's not true. 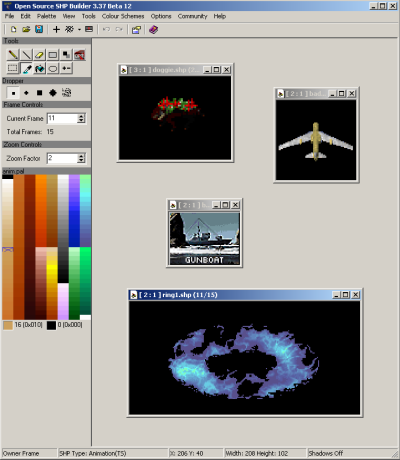 Try the Infurion colour conversion method when importing with 3.35. Top notch quality! Better than XCC and Photoshop, but very slow, I know. Hmmm... yea, Infurion uses a lot of RAM and depending on the size of your image, you may need a bigger swap file. Actually, in your case, it's recommended at least 1.5x of what you have, so it would be 768mb of swap file. The 3D RGB Full Difference has also a nice quality of doesn't use much RAM and it's very fast. Some PCX files are not compatible with the program. I'm not sure if this is your case. The 3D RGB Full Difference and Infurion things are inside Image -> SHP. PCX is a very complex format and I'm using someone's library. I can't waste so much time with a damn file format, honestly. Oh... then use the Import thing that is much better. Banshee... I truly commend you for creating this godlike program. Thank you. Then, be my guest and work on it. You should post topics about your problems with the most recent OS SHP Builder version (3.36 beta 03) at the Beta Testing forum. The problem of the copy and paste (from clipboard) from OS SHP Builder is that if you are pasting a bigger image, it won't paste the whole thing. Use of pink background to import stuff to OS SHP Builder is not good, specially if you use programs that uses anti-aliasing effects (like Photoshop). OS SHP Builder may confuse some of the anti-aliased pinks as those useless pinks from the palette. It is not a bug. It is a limitation. However, Photoshop and other programs would do the same mistake. I think info pages like this should be made for all the utilities at PPM, and should be accessed when you click the name in the navbar. That way you have some information about what it is you're downloading. It would also be helpful for people mirroring the programs, as they can just summarize or link to the description here. Update: OS SHP Builder 3.36 released! Update: I've added a button for donations. Every donation submited throught this button will speed up the development of the program. Update: The donate button's currency has been changed to Euros, because the server is charging in euros and I've just figured out that paypal does not convert existing dollars into euros when paying recurring payments. I'm doing the same thing for all donate buttons in PPM. Update: We've now included the download to OS SHP Builder 3.37 Beta, as it is more reliable than the 3.36 itself. I've also added a random picture of the program. This 3.37 version already has an auto-installer included that download the files from the SVN, like what VXLSE III does. Does it fail for you? Did when? This auto-installer was added in this year. Did you tried a version with the auto-installer? I had this error when I copied the .EXE alone in a directory. Is it the case for you? Or do you run the .EXE in the same directory that his resources are in? This also just happened for me after I installed the 3.37 beta and it automatically tried to open the program, but after clicking away the error messages and attempting to start OS SHP Builder again from the directory it was installed in, it ran perfectly fine. Maybe the reason for this is that it tried to run itself from the directory I first launched and installed the SHP_Builder.exe file I just downloaded from, while this is not the directory where I installed OS SHP Builder to? 1. There's a pop-up error when SHP_BUILDER.dat is missing, when running OSSB (but it still runs afterwards). 2. There's a pop-up error when the cursors are missing, after the installer runs (but the download starts ok). 3. After downloading, the Cameos come empty (as tomsons said). 4. There's a pop-up error when commlist.ini is missing, when running OSSB ( and it doesnt run afterwards ). funny what's inside. Totally not the content of the original commlist.ini haha. Thanks for the feedback. I wish I have received that before. When I tested this system, it seemed to work fine here. I'll investigate each issue and try to solve it in future committs. I'm starting to fix a couple of bugs here, but the result is not stable yet. Some problems you mentioned (and they are fixed now) were related to a xml file that it grabs to figure out which files that the program needs to download in the installation. So, with this file, I've fixed the empty cameos in CameoBG problem and the corrupted commlist.ini. However, in my internal tests, I'm getting an endless install loop. There might be some missing file that I'm not catching at the moment. I'll keep investigating. Could you try again? (Installing in a directory that has no previous OS SHP Builder content). Revision 31 should hopefully fix the cursor issue tomsons26lv has reported. I just tried it; after installing an error popped up saying "File not found." I then tried starting OS SHP Builder from it's install directory, but it gave the same message, but then still opened and showed the options menu; I closed this (which gave me access to the program) and closed OSSB as well. I then started OSSB for a second time, but now it gave a different error message: "Access violation at address 00405FB9 in module 'SHP_Builder.exe'. Read of address 00000000." After clicking on OK the program opened as normal. Every time I start OSSB I get this error message now however. Ok.... it's still not good, but things have improved. So, did you install in a different directory than you ran it for the first time, right? So far, I understood that the File not found program came from RunAProgram function that tried to run a null program. However, what triggered that situation is so far beyond my knowledge. I'll keep investigating, but be sure that I want this auto-installer working correctly asap and your help is being very valuable. I downloaded the current build and ran the installer, and without noticing I chose the default install path. 'ShellExecute error #2: File 'C:\Program Files(x86)\CnCTools\OS SHP Builder\SHP_Builder.exe' not found. I went to check and even though it says a couple files were downloaded, there's nothing on the disk. The path 'C:\Program Files (x86)\CnCTools' doesn't even exist. Note: btw I install choose 'Install as portable' and with the .exe in an otherwise empty directory. Is there a way to start the installer without doing that? I install again, but this time in the same dir. Everything wenk ok, the .exe was skipped because it was the same version. I ran OSSB, no pop-up, no error. Do I try with the last vers' executable? I installed with the last version executable, but SHP_Builder.exe was skipped. And I'm pretty sure it's not the same build as the new because it's 1,903 KB whereas the new is 1,913 KB. My tests were done with Windows XP, which doesn't have UAC. By default, OS SHP Builder doesn't have nor request administrative powers. That should cause problems on certain machines with Windows Vista, 7 or 8. I'll commit a version that will verify if the installation directory has been succesfully created and warn the user when it doesn't happen. Then, I'll start testing it in a Windows 7 laptop. Ok, I've seen what you've guys seen in my windows 7 laptop. It must have admin rights in order to work. And even with admin rights, it ends in a very weird and bizarre way, but after the file not found message, it works fine. So, my next step it is to force the install to run as another OS SHP Builder with admin rights and close the existing window. I know what I'm doing goes against Microsoft's standards, but I don't wanna do an installer for every single commit and I want to allow the program to be updated in a very simple manner. can't you just write in big letters "Run as Admin, before doing an update" ? That's an easy solution. However, the amount of people who tends to read this kind of warning is minimal. I'll try to figure out a way to detect windows vista or higher and if the program has admin powers or not instead. Then, I can send the warning or try to re-execute the program as admin. My Windows XP installs it fine. But my Windows 7 (64 bits) has this UAC issue when I try to install it in Program Files (x86) if I do not run it as Administrator. What I've noticed, but I could be wrong, is that, regardless of having admins powers or not, it creates the CnCTools directory. But if you don't have admin powers, the paste becomes invisible in the system. In this case, the palettes usually fails when downloading... probably due to timing (they are the first to be downloaded), but the other files are downloaded correctly, except for the executable one and maybe another one or two files. But, since it is invisible, the system won't recognize them. In the end of the installation, it tries to run OS SHP Builder again, but since the paste is invisible and the file wasn't downloaded correctly, it doesn't find it. My attempt to detect when this situation happens has failed in revision 32. I'll try to figure out another solution. If you run the 3.37 beta SHP_Builder.exe as admin in the first run, you won't have problems. well, did not run as admin for any thing. Most of the times I run the program and if it does not work I run as admin. I prefer to install all programs to custom folders, not the program 86 folder....... i never had any issues like others.... maybe I am the luckiest when it comes to C&C game and mod programs (with exception of the latest issue with LB & Ares). Maybe you were lucky or you've just installed to the same directory that you ran the file from. Anyway, the latest revision should fix most of the problems that were reported above. I just don't know if it solves the issues of installing things on program files without the bless from UAC, which is what I plan to test asap.